There’s no better way to spend a Sunday afternoon than wandering up and down Abbot Kinney Boulevard, the famed stretch of Venice best known for its bohemian spirit, fashion, art and food... and now its own boutique marijuana dispensary. Lined by rows of towering palm trees, the boulevard embodies the best of not just a buzzing beach town, but also the heartbeat of LA-hip. Sophisticated and trend-setting, Abbot Kinney keeps ahold of its laidback Venice vibe. What is there not to love? With picturesque pacific sunsets framed by palm tree silhouettes, Instagram was made for places like Abbot Kinney. Yet the area retains an iconic hometown Americana feel, with both locals and tourists riding rented bikes, sun shining on their faces and handmade ice cream in their hands. If you arrive early enough in the day, you’ll catch surf boarders returning from a morning surf at Venice Beach. Whether you love window-shopping or people-watching, this is the place for you. Abbot Kinney, crowned one of the top shopping streets in the world, features some of the best boutiques LA has to offer. From eccentric thrift shops and unique bazaars to edgy cafes and funky eateries, there is something for everyone. The hipster alternative to Melrose, these shops curate a chic and new-age vibe. Burro is the place to go to for genuine novelties and souvenirs of the California aesthetic, while Aust satisfies your indie, underground Australian fashion appetite. You’ll be spending so much time on Abbot Kinney that you’ll surely need a bite to eat, and the boulevard does not leave you wanting. For extra pep in your step, head to Intelligentsia—LA’s most famous coffee bar. For something more substantial, turn to Gjelina for New American cuisine or Felix Trattoria for handmade pasta. Looking for a drink? There’s The Brig—a true dive bar that recently received a modest facelift. The pool table and classic jukebox remain as reminders of its seedier, edgier past. For dark wood paneling, a dimly lit ambiance, and the feel of a tasting room in a wine cellar, you have South End. Or if you prefer airy and stark-white (and are nostalgic for New England), Salt Air is where you need to be. And on the first Friday of the month, food trucks line the street with tastes from around the world.. and some tastes found only in LA. 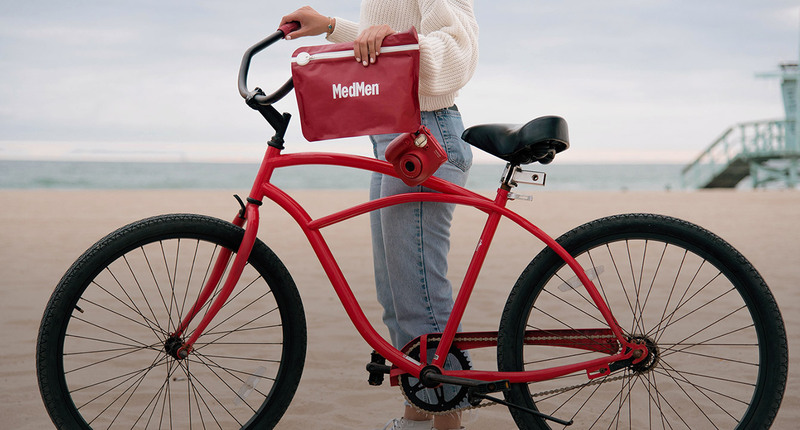 Before you finish your time on Abbot Kinney, take a stop by the newest addition to the neighborhood: MedMen Abbot Kinney, the stylish street’s first premium cannabis dispensary. If Abbot Kinney is the perfect marriage of old-school funk and upscale hip, then MedMen’s newest shop is right at home on the boulevard. Step inside and you’ll instantly recognize MedMen’s signature aesthetic sensibility. The dark wood display tables house iPads full of information about your favorite cannabis products and the open, industrial-accented floor plan invites you to explore. It is a unique shopping experience that is a balance of new and familiar, just like Abbot Kinney itself. MedMen Abbot Kinney is an easy few blocks from the Metro 733 bus stop at the Abbot Kinney Memorial Branch Library on the corner of Abbot Kinney and Venice Boulevards. Or take the Santa Monica Big Blue Bus #1 from the end of the Expo Line in Santa Monica. If you live near Abbot Kinney, just stroll on over to the newest marijuana dispensary near you. You can even plan your adventure on the boulevard by renting a bike through Metro.Bicycle racks are located in front of Gjelina and Blue Bottle Coffee. Abbot Kinney truly offers the best of LA and Southern California, and MedMen Abbot Kinney is no exception. It is a moment not to be missed.